Hunger is an issue that affects every country in the world; globally, one in eight people do not receive the daily nutrition they need, and often women and children suffer the most. Organizations such as the World Food Programme, Food and Agriculture Organization, and USAID work every day to help those in need, whether due to rising food costs, natural disasters, or conflict, but it is imperative that they have accurate data to inform their actions. At GeoPoll we work to bring a deeper, more granular understanding to topics such as food security, and we do so by using the power of the mobile phone. A new report by the UN International Telecommunications Union found that while fixed-line telephone connections have been declining over the past five years, mobile penetration is growing fast, particularly in developing areas, and the number of mobile subscriptions is expected to surpass seven billion this year. By taking advantage of these connections, we can reach people more quickly, to drive action on food security that is faster and more targeted. In just the past few weeks, GeoPoll has been asking simple questions on important topics like health, energy, and food security to mobile users in six African nations: Ghana, Kenya, Malawi, Nigeria, South Africa, and Uganda. On food security, defined as reliable access to affordable and nutritious food, users were asked “In the last 7 days, did any members of your household go to bed hungry? Reply 1) Yes 2) No.” This one-line question, asked every day to a sample of users, gives us vital information on not only how many people are suffering from hunger, but also where they are, what ages and genders are more likely to be affected, and how food security changes in a region over time. The results from just two weeks of data collection can already provide high-level insights into the differences in food security across countries, and as the survey continues to run it will collect data that can be broken down by district, age, gender, and more, for a truly granular look into hunger in a country. From the data that has already been collected, we get a snapshot look into the lives of those living in hunger. 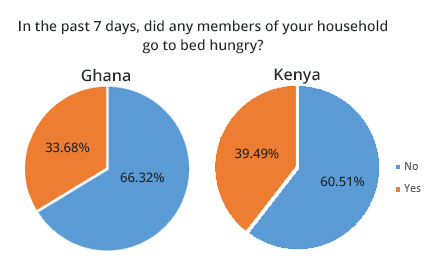 For example, it was found that 39% of respondents across Kenya reported that they or a member of their family had gone to bed hungry in the past week, and 34% of Ghanaians said the same. This data allows us to more accurately identify which countries or regions are in need of immediate assistance, and enables aid organizations or governments to deliver supplies quickly. As this survey collects more data over the next months, it will demonstrate when food security changes suddenly: this can occur when a region enters its dry season, or if a conflict has decreased access to food. This type of daily data provides us with an unprecedented, granular look into global hunger, and will drive faster, more effective action from organizations like the WFP, who GeoPoll has worked with in the Democratic Republic of Congo and now in Kenya and other countries in Sub-Saharan Africa. We still have a long way to go in the fight against hunger, and the ultimate solution will include the alleviation of poverty through economic development, agricultural productivity, and policy reform. 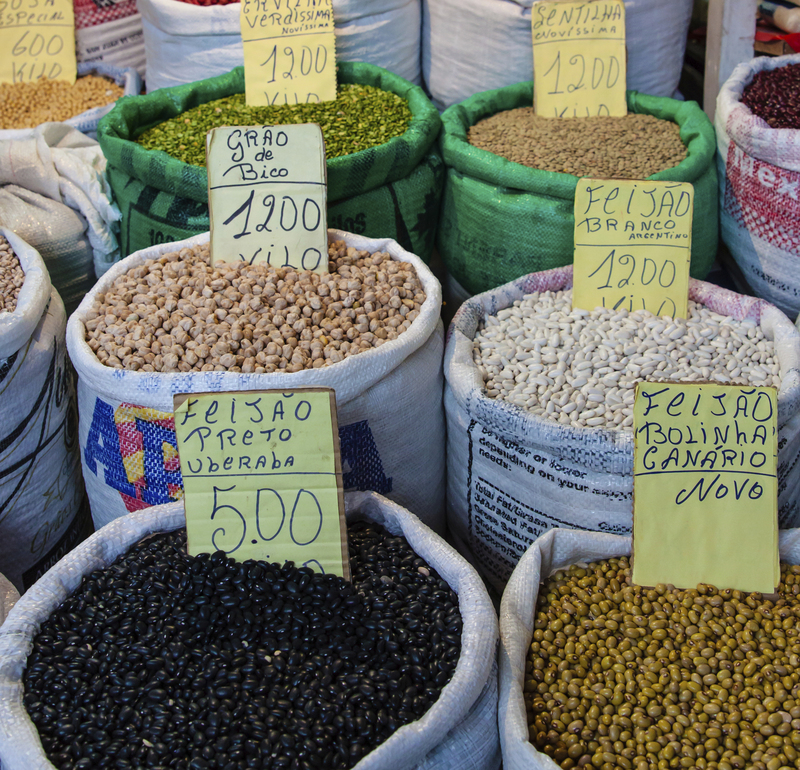 Data is only a piece of this puzzle, but accurate information can play an important part in predicting trends on not only food security situations, but also poverty reduction, which will help us end hunger once and for all. Amy Sweeney is the Director of Client Business Development at GeoPoll, where she collaborates with potential clients and partners such as the World Food Programme, USAID, and implementing partners on incorporating mobile data collection into projects and programs. She previously worked at Chemonics International and spent four years in Central and Southwest Asia, serving as a Peace Corps Volunteer in Uzbekistan and working in Afghanistan and Turkey.